The NYT published a striking photo yesterday of the ceremony in which the President signed his highly touted (and much defended) terror interrogation legislation. (Story.) If you can find a more bitter image of legislative triumph, I’d love to see it. The NYT shot frames the moment immediately after Bush finishes his statement and moves from the lectern to the signing table. Reviewing the text and video, it seems that the tension was there from the start. I say that because Senator Warner, and, to a lesser extent, Congressional hawk Duncan Hunter, look distant and uncomfortable throughout Bush’s statement. In the video, in fact, Warner offers a case-study in legislative torture. The Senate Armed Services Committee chairman makes a nervous gesture with his mouth almost every time Bush makes a strident statement or lists a debatable achievement in the GWOT. When Bush asks: “Did this generation of Americans take the threat seriously, and did we do what it took to defeat that threat?”, Warner starts swallowing, shifting on his feet, then opens his mouth in a disturbed way and stares directly at Bush through narrow eyes. The most interesting thing, though, is what happened when Bush sat down at the signing table. 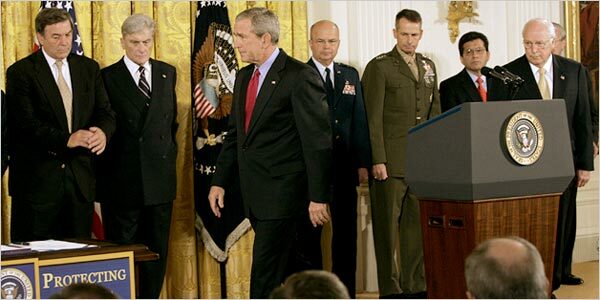 Dubya had to actually coax the legislators to move around and stand next to him. And he had to do it not once, but twice. As I’ve discussed before, people are psychologically oriented to overlook these brief social ruptures. For Bush, however, those six seconds (I counted them), must have seemed excruciating. As I highlighted a few weeks ago (link), Dubya is carrying around a good deal of anger, and seems to be losing the ability to publicly contain his agitation. On first pass, one might attribute Warner’s flinching to the legislation. I don’t think so, though. Based on the visuals, Bush was angry coming into the ceremony, all the players felt it (note the affect of the White House crew, particularly Cheney and Pace), and everyone felt thoroughly chastened by it. Nobody wants to be around someone who is angry and vindictive. Nobody can feel comfortable around such a person. And certainly, no one could feel comfortable going out on a limb for someone whose vehemence — especially in matters of life-or-death, not to mention profound political and historical significance — could, as easily, be taken for craziness. And this, in a moment of victory.